The Best Comics of 2012! A DEFINITIVE LIST. Having spent many weeks attempting to decide which of these was my favourite, I eventually decided I couldn’t, so we have a tie. 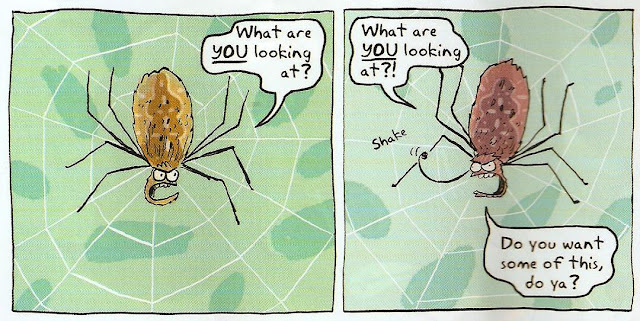 I love both of these strips for similar reasons – that they are very, very funny, and wildly imaginative, and that my son loves them and I love reading them to him. Each also has a special claim in its favour that kind of balance each other out: BvM has achieved the highly admirable feat of being amazing every single week in 2012. And in the other corner, Gary’s Garden produced amongst its many riches the single best page of comics I saw all year. * So that is why it’s a tie! *I don't have it to hand, sorry. It was the one with the pond and the tadpoles. If you saw it, you know which one I mean. Yeah, yeah, another Phoenix strip, I know. But if you can show me another comic out there that is – week in, week out - as funny, clever, inventive, silly, gross, imaginative, fascinating, and beautiful as Adam’s work on Corpse Talk... well then I will be very grateful to you for introducing me to such a wonder. I don’t feel like I need to say much about this one, as I assume it is on everyone else in the universe and their dog’s Best Of 2012 lists already. An absolutely glorious achievement, one of my favourite comics I’ve read in ages, by probably my favourite comics artist in the world. Yeah, it’s a bit good. HONOURABLE MENTION: pretty much everything else in the Phoenix. I utterly love that comic. Not sure if I mentioned that. I think if this was an FPI post I’d have to come up with lists of my favourite movies, and TV shows, and books and such, too. But really, who has time to watch movies or TV or read books? We went to see Looper, that was quite enjoyable. Ooh, Catfish, I liked that. Um... Doctor Who? Cheers? I watched quite a lot of Masterchef? I would also then be called upon to give you a quick plug for what you can expect to see from me in 2013 but hey, this is my blog, I talk about that stuff all the time. 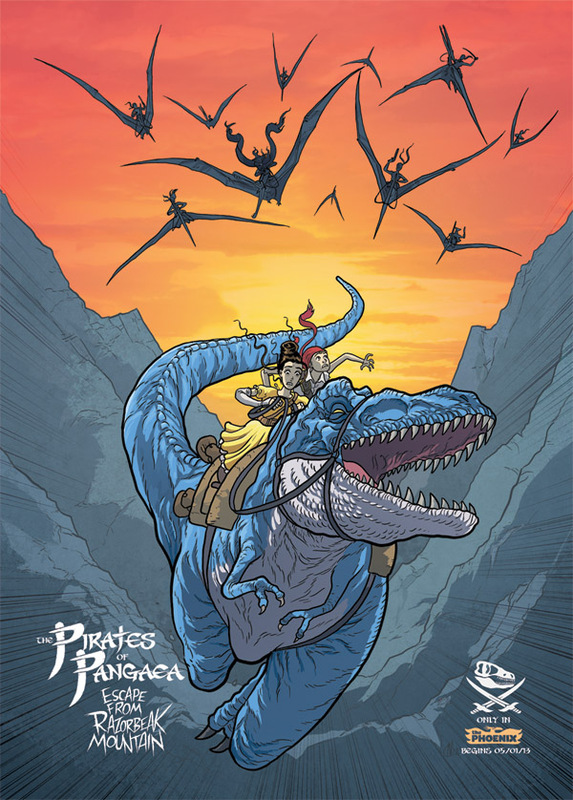 More Pirates of Pangaea! Coming Soon! Coming, in fact, NEXT WEEK! 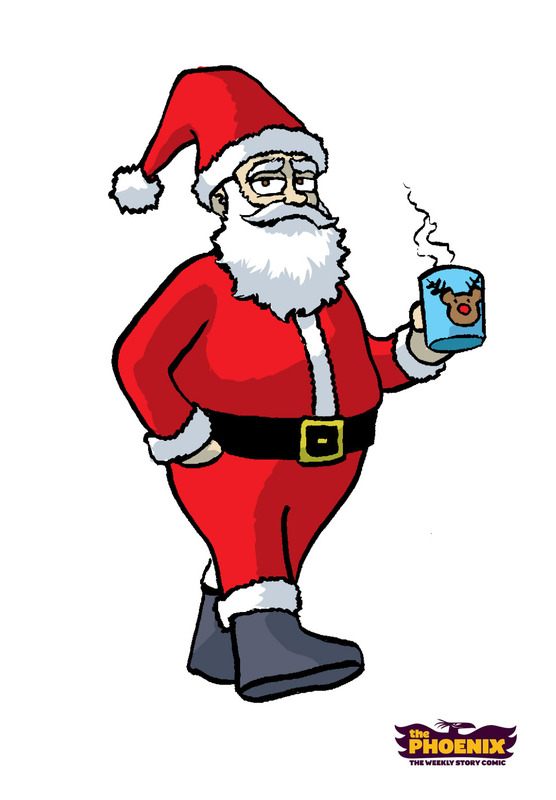 I've been a bit slack at posting my daily Santa drawings here on the blog, so here is a bumper omnibus round-up of Santas 13-20! 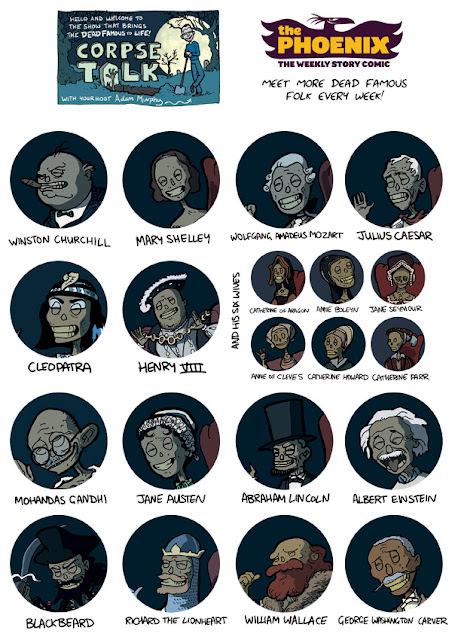 Check out the full set (and all the names of the Santa-suggesters) over on the Art Monkey page on the Phoenix site! I thought taking requests from Phoenix readers would be an interesting exercise, and was really just hoping it would throw up some New Things For Me To Draw - something that, after drawing several years worth of Santas, was actually becoming a little challenging. Anyway, I think I can safely say this objective has been MET. Met with bells on. Anyway, a further delightful surprise was supplied by those fine folks at the Phoenix who took some of the Santas and applied some cutting-edge animation techniques and high-end musical production, and produced... THIS. Starting on 5th January 2013 in issue 53 (I think) of The Phoenix is the second FRANKLY EPIC run of m'colleague Dan Hartwell and I's Pirates-and-Dinosaurs-and-Pirates-RIDING-Dinosaurs adventure tale, The Pirates of Pangaea. It's another big one. OH MAN is it a big one. 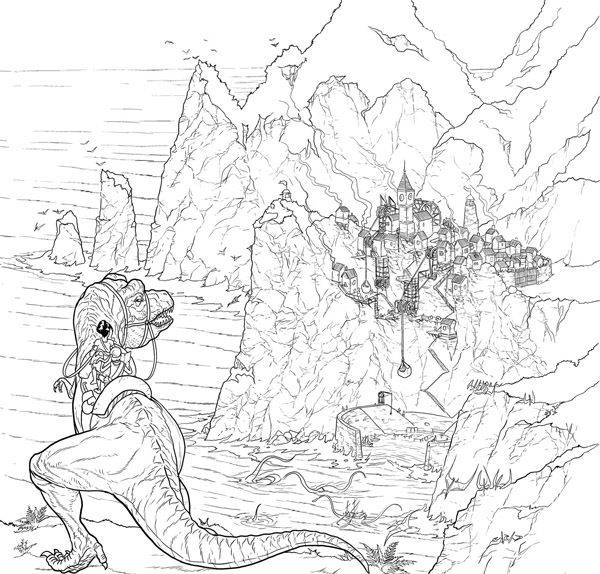 Here are a couple of not-too-spoilery choice panels of the inked artwork, to give you a taste. Such fun stuff coming up. 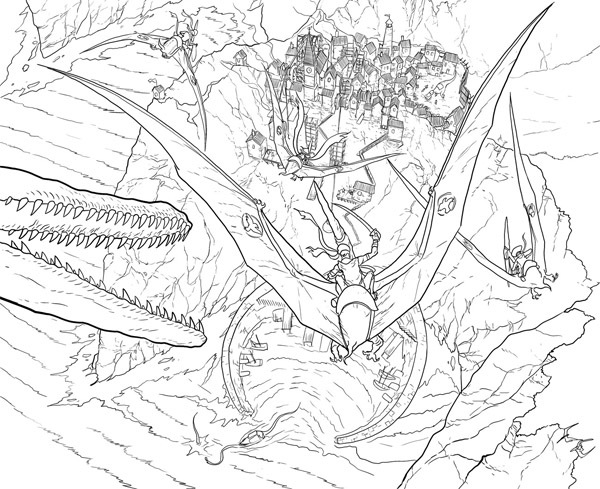 To make sure you don't miss out on a single teeny tiny pterosaur, why not rush out and subscribe to the Phoenix? Go on. This Christmas, give the gift of PIRATES RIDING DINOSAURS. 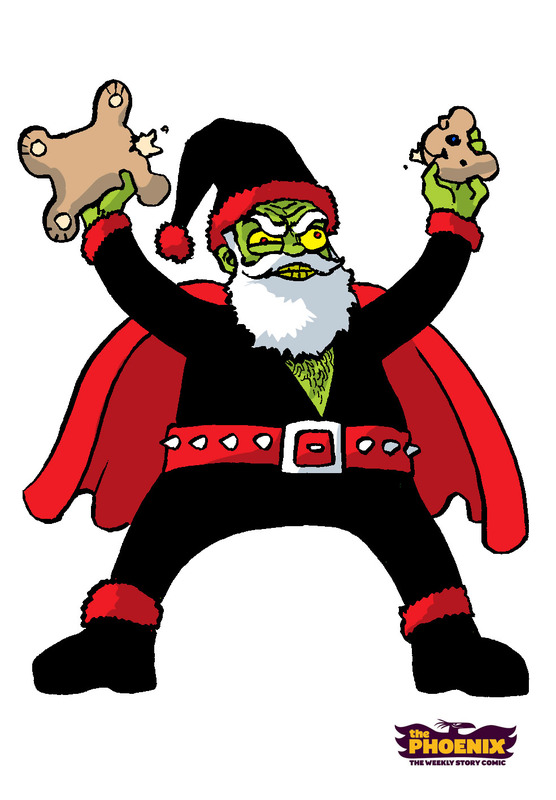 Advent Monkey, day 12: Junk Food Santa! 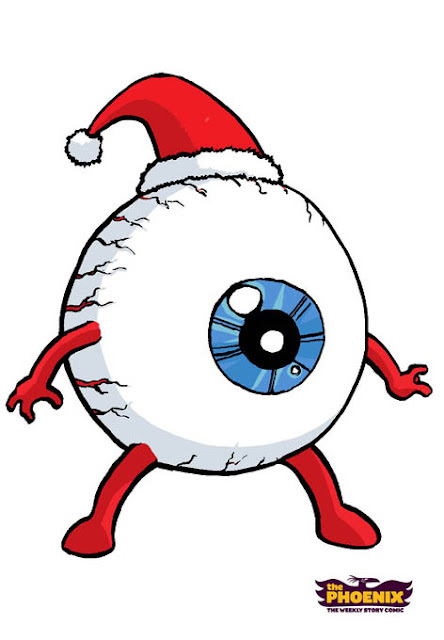 Behind Door Number 12 on Art Monkey's Advent Calendar, it's... 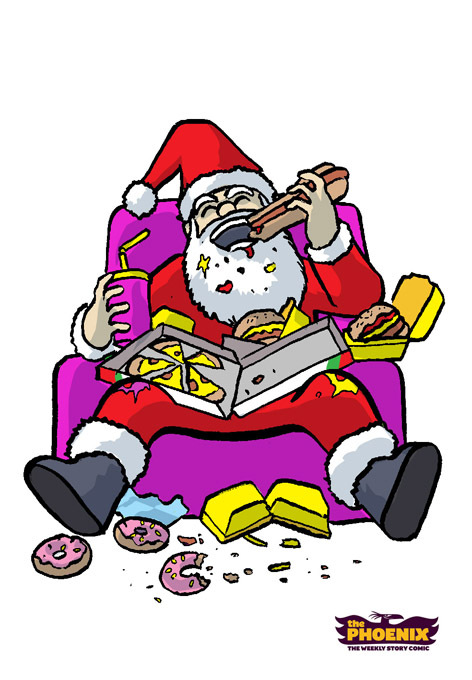 Junk Food Santa! Suggested by Phoenix reader, Roisin McAuliffe! Dammit, why are all these Santas making me HUNGRY? Advent Monkey, day 11: SQUID SANTA! 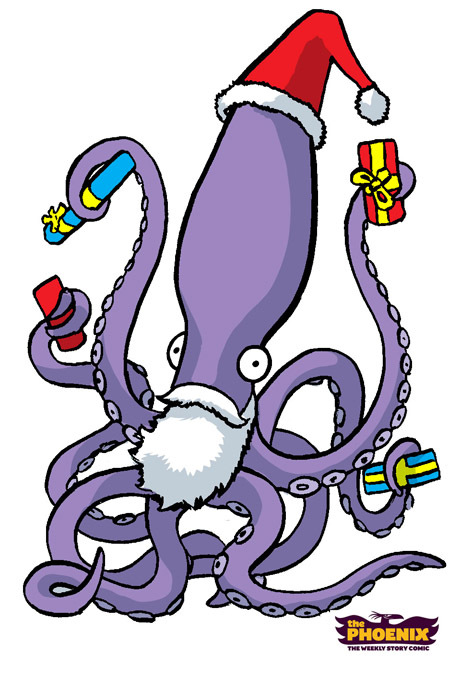 Behind Door Number 11 on Art Monkey's Advent Calendar, it's... Squid Santa! Suggested by Phoenix reader, graffiti knitter and noted squid afficionado Lauren O'Farrell! 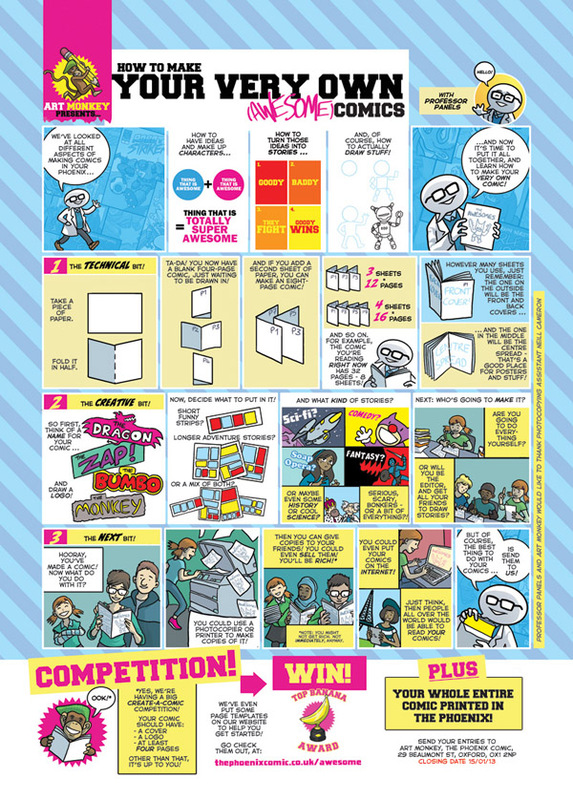 How To Make (Awesome) Comics COMPETITION! This week's How To Make (Awesome) Comics strip in the Phoenix - which by kind permission I have reproduced in its entirety here - features the start of a brand-new and very exciting Create-a-Comic COMPETITION! It's kind of the wrapping-up of a year's worth of Professor Panels and Art Monkey's lessons, and I thought it would be nice to go out in style by encouraging the comics' readers to pull it all together and have a go at making their own panelologist publications! The rules are very simple - comics should be at least 4 pages long, and have a title, and THAT'S ABOUT IT. Go nuts! The closing date is the 15th January 2013, so there's plenty of time to plan and make and create - maybe as a little project over the Christmas holidays? 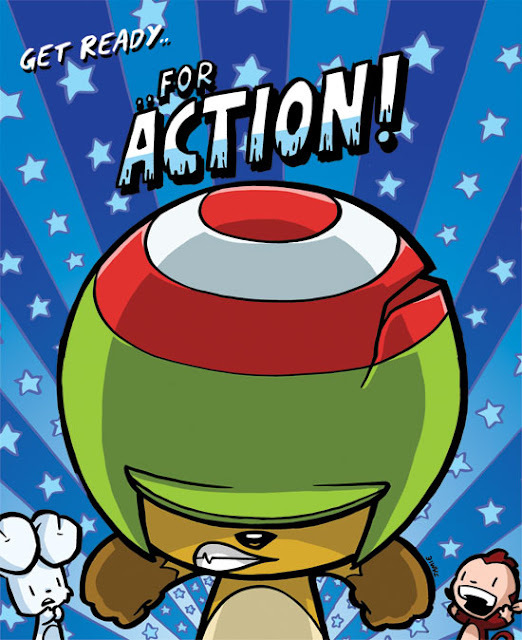 M'colleague Sarah McIntyre wrote a great blog post the other day for librarians about getting started with kids' comics, and mentioned some of the many benefits that comics - reading them and making them - give to children. I'd strongly recommend reading her post; it's something I couldn't agree with more, and this competition is part of my ongoing bid to help get every child in the country busily making their own comics. 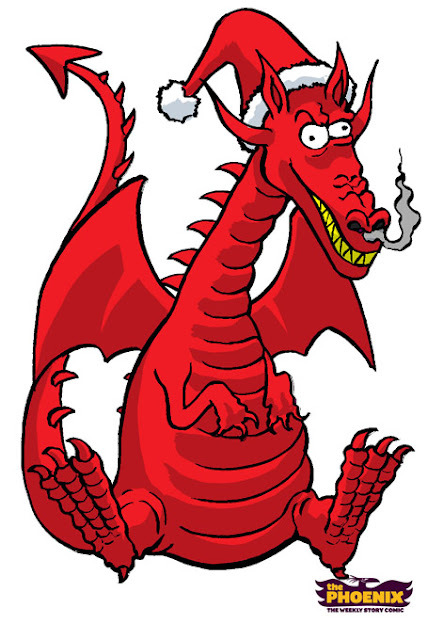 Pick up this week's Phoenix or head over to the website for all the details (scroll down past all the Santas), and for loads of page templates and activity sheets and all kinds of FUN STUFF to get you started. And I hope to see MANY FINE COMICS in January! 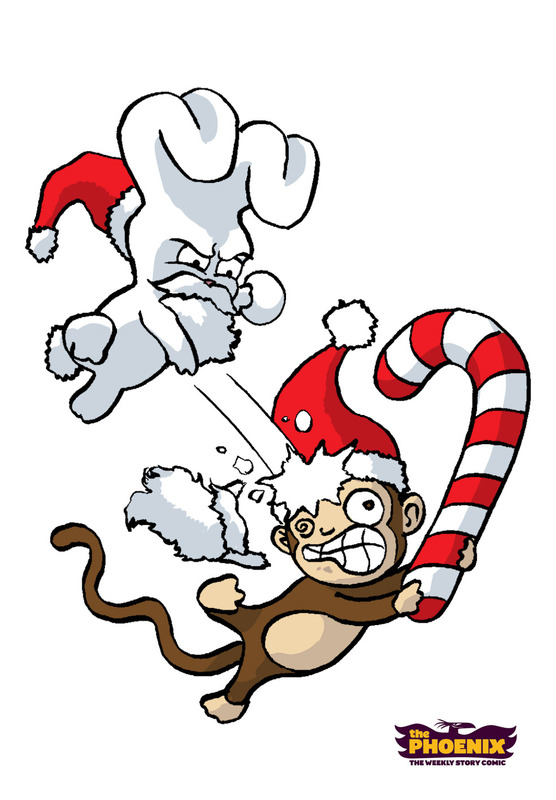 Advent Monkey, day 10: Chocolate Santa! 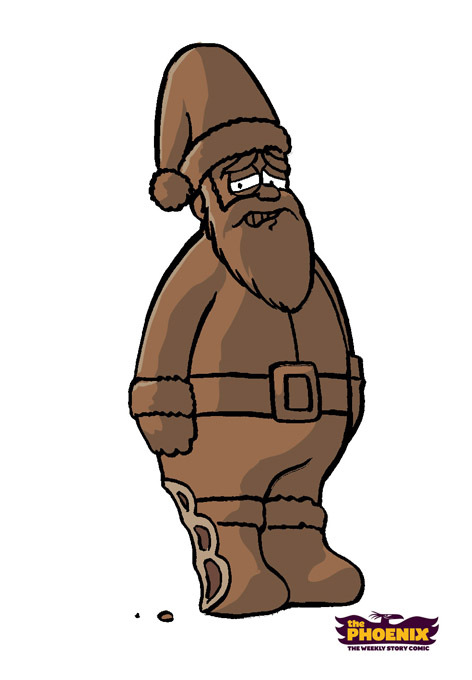 Behind Door Number 10 on Art Monkey's Advent Calendar, it's... Chocolate Santa! Suggested by Phoenix reader Emily (age 9)! 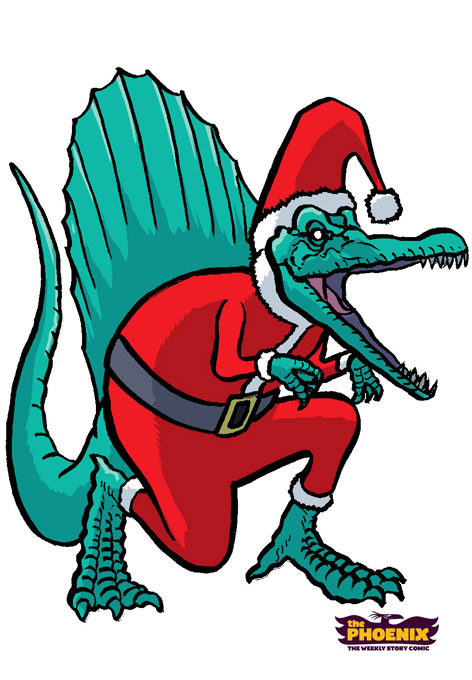 Advent Monkey, day 9: Spinosaurus Santa! Behind Door Number 9 on Art Monkey's Advent Calendar, it's... Spinosaurus Santa! Suggested by Phoenix reader Freddie Walker! Behind Door Number 8 on Art Monkey's Advent Calendar, it's... Banana Banana Santa (and his Bananas Bananas Bananas)! Suggested by - well, by several people in fact, including Phoenix readers and pals James Christie, Jez Higgins and Craig Naples! Thanks all! 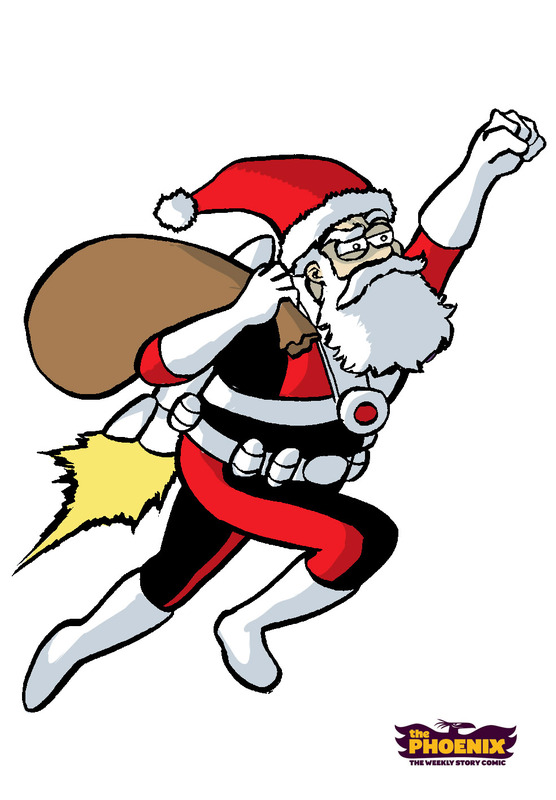 By the way, while I'm here: just in case anyone thinks I have been corrupted by the filthy lucre of Big (well, medium-sized) Comics, I just wanted to make clear that this year's ridiculous Santafest is, as in previous years, done simply out of the spirit of the season and because I like drawing Santas. I just thought that this year I could sort of tie it in with the Phoenix - well, as my Christmas present to them, really. It's a publication and a readership that have made 2012 pretty much the best year of my creative career to date, and I just wanted to do something to say thanks. 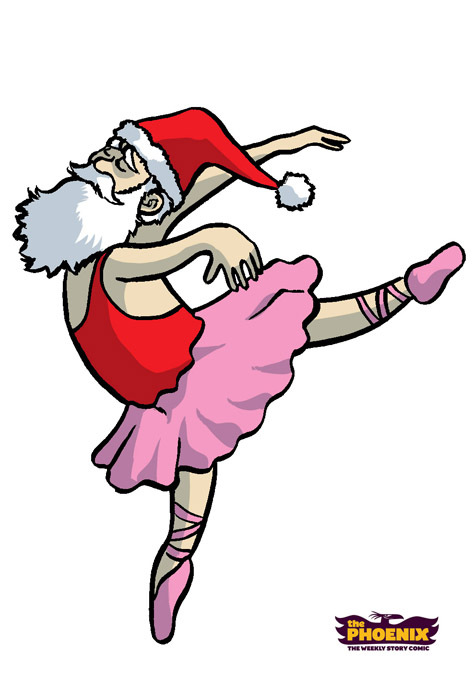 Behind Door Number 7 on Art Monkey's Advent Calendar, it's... Ballet Santa! Suggested by Phoenix reader and comics superbrain Jenni Scott! 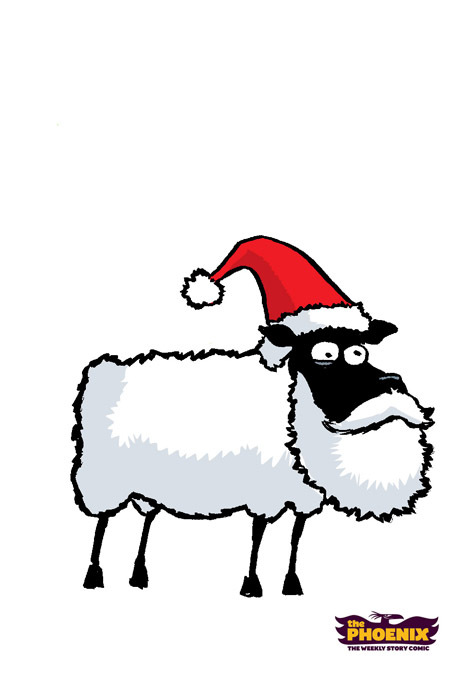 Behind Door Number 6 on Art Monkey's Advent Calendar, it's... 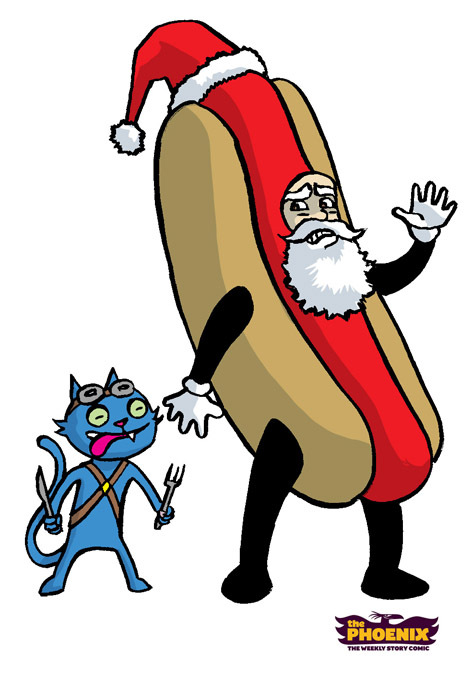 Hot Dog Santa! Suggested by my own dear nephew, Phoenix reader and budding comics artist Lex Cameron! 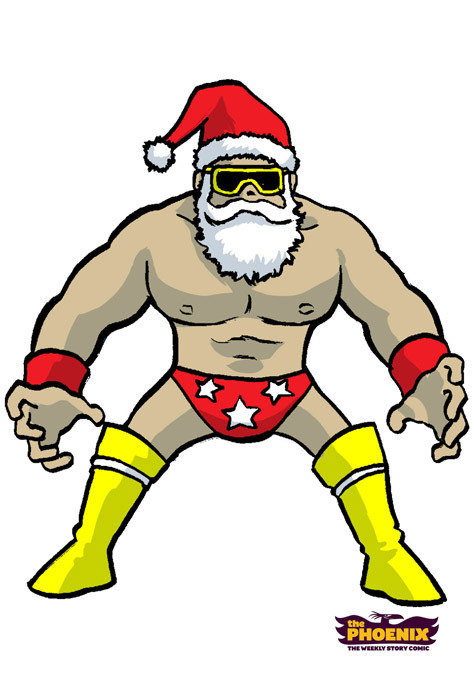 Behind Door Number 5 on Art Monkey's Advent Calendar, it's... Wrestler Santa! Suggested by Phoenix reader and noted Santa afficionado Chris Sims! 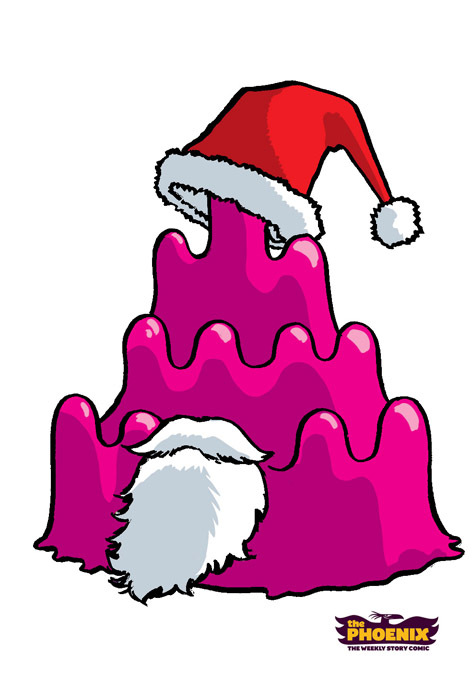 Behind Door Number 4 on Art Monkey's Advent Calendar, it's... Jelly Santa! Suggested by Phoenix reader Luke Reid! 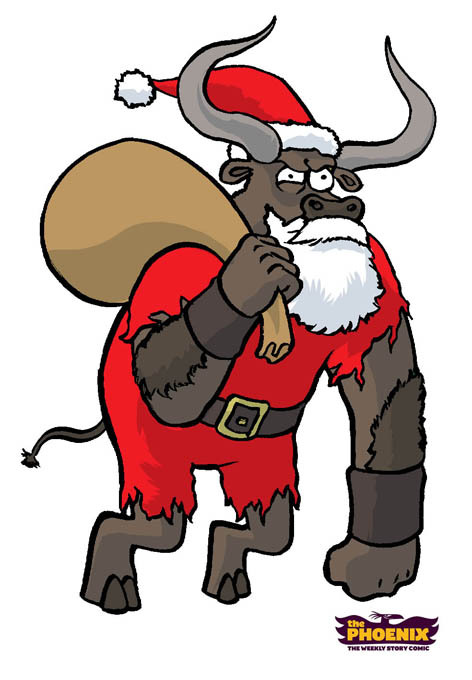 Santas Santas Santas! Also, Santas. Yes, it's that time of year again! The time when for some reason, despite having way too much work to do already, I decide to draw a different Santa every day and post it on the internet! (For new followers: seriously, every year. 2008, 2009, 2010... I took a year off in 2011 and look, apparently now the world is going to end. Sorry about that.) Actually, this year's is going to be a little different - rather than drawing them myself I will merely be facilitating the event for my colleague Art Monkey, famed sketching simian star of the fabulous Phoenix Comic. Every day he'll be drawing a different Santa, based where possible on suggestions from readers of that august periodical. 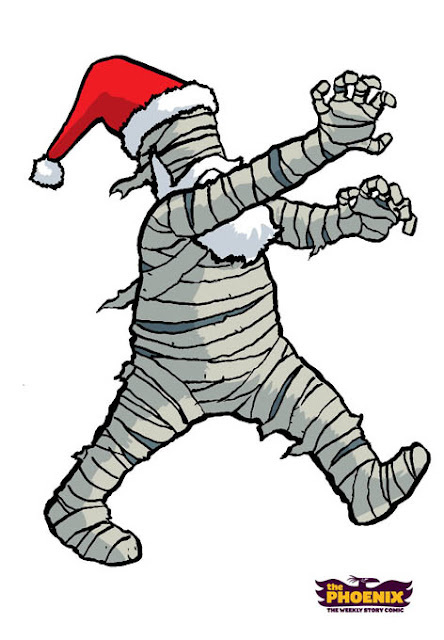 So if you - or any young Phoenix fans in your family - have any Santas you would particularly like to see, email them to artmonkey@thephoenixcomic.co.uk (I hope he doesn't mind me giving out his address like that). Or, you know what, just tell me and I'll make sure I pass them on next time I see him. 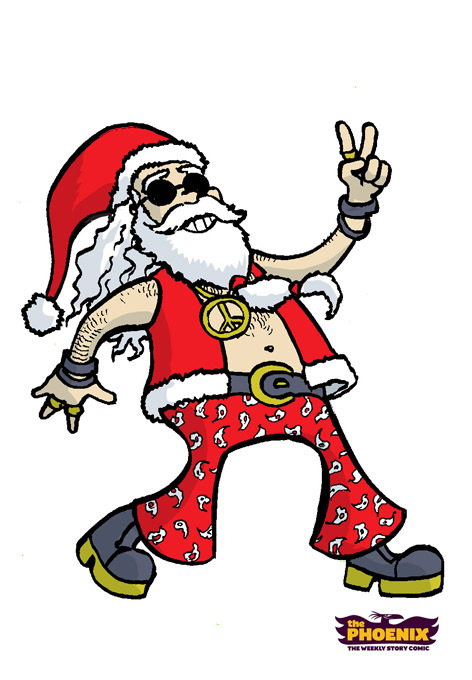 Hippy Santa! Suggested by Gemma Stephens. 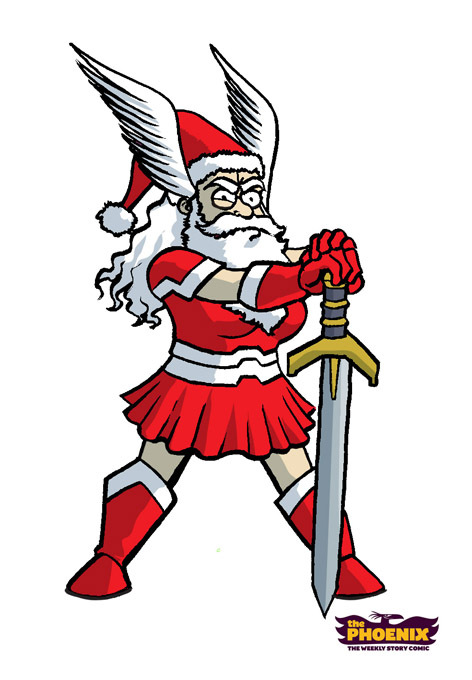 And today's entry was (my favourite so far): VALKYRIE SANTA, who you met at the top of this post - suggested by Phoenix fan Holly (daughter of @miss_sb on twitter). AND as if that wasn't enough early-seeming festive cheer: I spent Thursday evening and then much of Saturday this week at the Oxford city branch of Waterstones, where my Phoenix colleagues Kate Brown, Paul Duffield and I were helping put together a funky window display. Paul and Kate finishing up the logo! Santa Cornflower! Having her feet tickled by Bob. 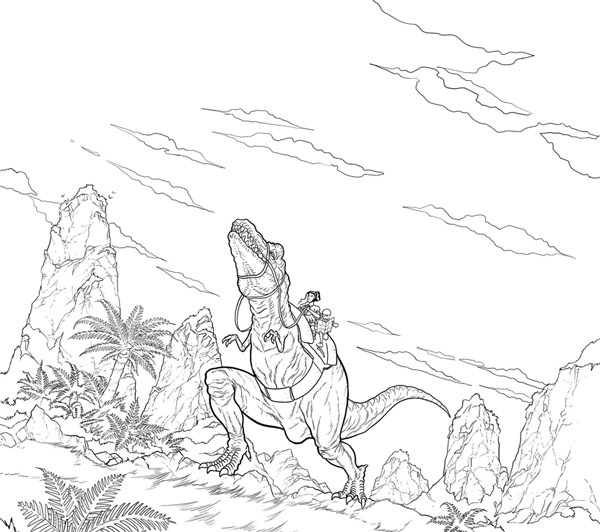 Paul Duffield, touching up a T-Rex. The window painting was a lot of fun - it took a bit longer than originally planned but I genuinely loved the results, it just looks brilliant and hoepfully will entice lots of curious punters inside to buy comics and gift boxes. 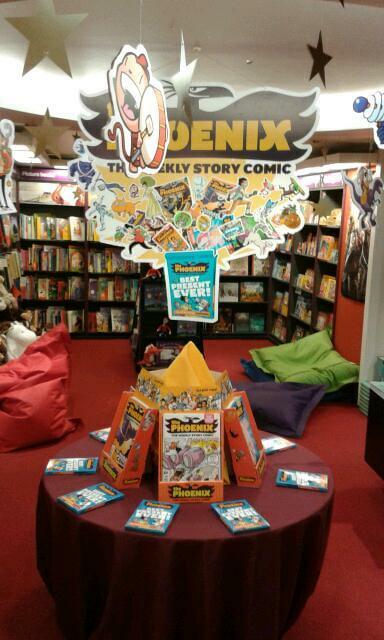 Seriously, if you live in Oxford, drag your kids down to Waterstones childrens section to check out the Phoenix Nest that's currently on display. It is RATHER MAGNIFICENT. 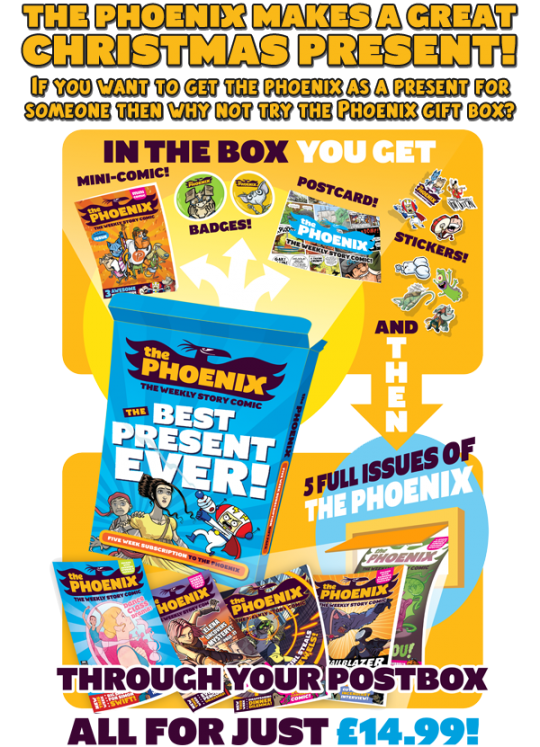 If you look closely at that image you'll see they're not only selling the weekly comic, they also have a stock of the rather excellent new Phoenix Gift Boxes. Each contains a brilliant little mini-comic, some badges and stickers and postcards and stuff, and- most important - a 5-issue gift subscription to the Phoenix! "BEST PRESENT EVER!" the box cries out, and frankly I rather agree. ...and let me tell you, you will not be wanting to miss THAT. 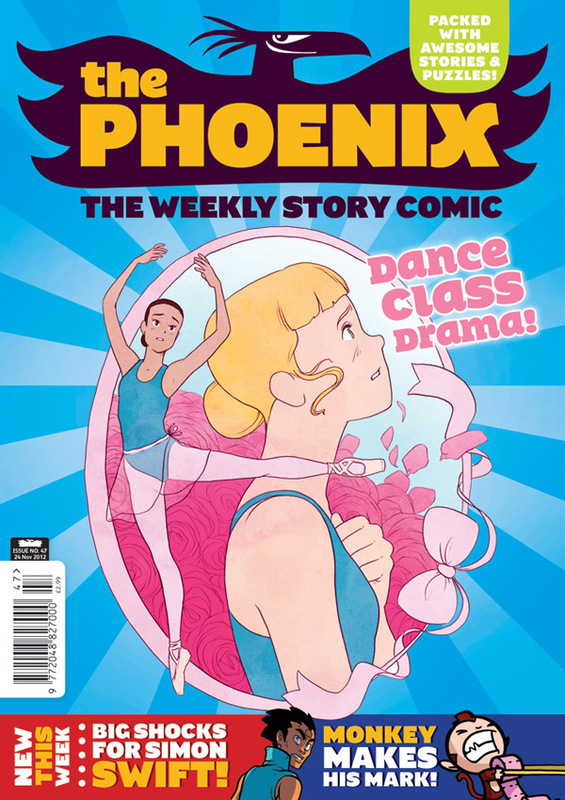 This week's issue of The Phoenix features the story 'Emilie's Turn', written by me and drawn by Kate Brown. You can see the cover above. Please consider this me asking you nicely to PLEASE GO BUY A COPY. Look, I'll make it easy for you, I'll even tell you how and where to get a copy, and everything. It's a bit of a departure for me - apart from anything else, it's pretty much my first attempt at writing a script for another artist to draw. 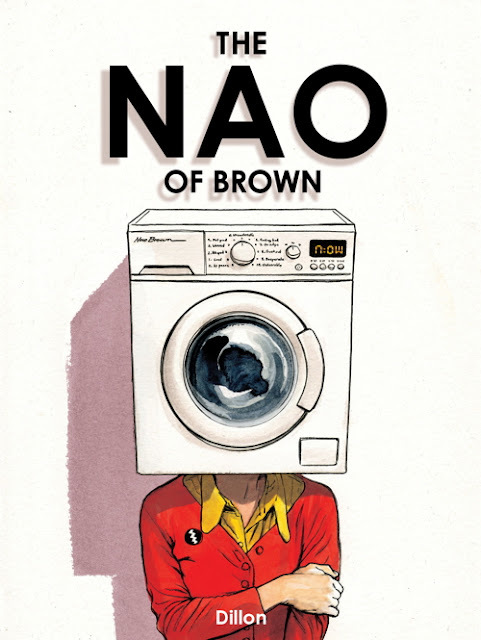 And I have to say, if you're going to do this, you could do a lot worse than collaborating with Kate Brown, unquestionably one of the most talented comics creators currently working in this country. It has been an amazing and rather wonderful experience for me - I just write down what happens and then, as if by magic, these amazing pages of beautiful artwork appear! Crazy. Seriously, I could get used to this "being a writer" lark. Anyway, I'm trying to do whatever I can to bang the drum and blow the horns and let people know about the comic, because - well, (a) because I'm really proud of it, but also (b) because I don't want to be having any conversations a month from now where you're all like "oh what, you did a ballet comic? That sounds really cool, I wish I'd heard about it." If you remember a couple of months back I wrote a couple of blog posts on the subject of old Girls' Comics / YA comics, etc - well, anyway, this strip is my best attempt to encapsulate what I was trying to say with all that. Please go and read it. Please go and tell all your friends to read it. Please make it a massive success so that every publisher in the world suddenly starts falling over themselves to make more ballet comics. And look, without getting into the whole gendering argument: what it comes down to for me is this. We - the comics industry in general, the Phoenix in particular and me personally - tend to do quite a lot for those girls and boys who like stories about exciting adventure and outlandish fantasy and raucous comedy. It seems to me we could do more for those boys and girls who maybe want to read stories about the real world, and ballet, and having a bit of a cry. Look, here is a lovely review of it already, and everything. See? Now please go buy it. And if you already did: a massive, genuine, heartfelt: thank you. I hope you enjoyed it. 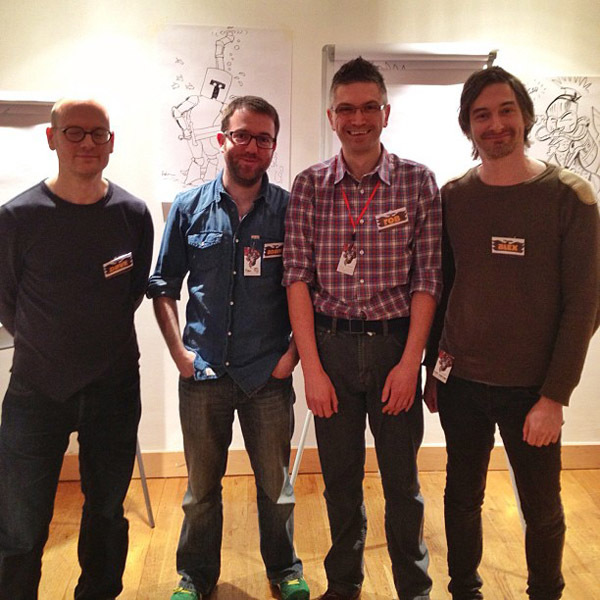 I spent last weekend at the brilliant Thought Bubble festival in Leeds and - well, as I say, it was rather brilliant. I'd like to reel off a great long post filled with photos of all the cool and lovely people I met, but I won't because (a) I'm terrible at managing to take photos at these things, and (b) to be honest, I barely made it away from the family area / drawing enclosure where I was helping out the Phoenix comic all weekend, and where I was being kept RATHER BUSY. And so, I shall tell you a bit about the various fun things we were doing there! FUN THING 1: over the whole weekend we were running a competition where we got young (and indeed, old) conventiongoers and Phoenix fans to have a go at designing their own creatures to go in our ZOO OF AWESOMENESS. Many participants chose to use the wheel (above) to get started coming up with ideas, and it was a brilliant thing to have around. There was one little girl aged 3 whose drawing skills were still basically at the 'squiggles' stage but who fell totally in love with that wheel and kept dragging her cosplaying Mum back over to the Phoenix tables every half hour or so to have another quick 20 or 30 spins. It was highly adorable. And that's something so nice about Thought Bubble - it's organisers do seem really commited to the idea that their comics show - like the medium of comics itself - should be FOR EVERYONE, from mature academics to cosplaying teenagers to 3-year-olds who just want to have some fun spinning a brightly coloured wheel. Needless to say, I applaud this principle. Anyway, it was hugely fun and I think the competition itself was pretty successful, in that we ran out of entry sheets (and indeed room on the wall to pin them up) by about 10:30am on the Sunday. It was really brilliant to see the sheer flood of creativity and insane ideas pouring out of all these young comics fans. Me and Gary have already picked the winners and indeed I have already drawn the strip in which they are brought to life and meet Professor Panels and Art Monkey and... well, I don't want to spoil anything. I think it's going to be appearing in the last Phoenix of 2012 (issue 52? I suppose?) and it really should be a bit special. Eyes peeled! Anyway, FUN THING 2: DRAW-OFF! On the Saturday, a whole bunch of my fellow Phoenix artists were participating in LIVE COMPETITIVE DRAWING CHALLENGES! I'm using caps locks to try and capture some sense of how stressful this was. Stressful but, of course, brilliant fun, and it seemed to go over very well with the crowds that gathered to watch each bout. A tense moment from the fiercely-fought first-round fixture between Alex Matthews and myself, in which we are attampting to draw Giant Butterfly-Tamers. The result was too close to call and went to a FRANKLY CONTROVERSIAL judges' decision. Photo courtesy of Craig Naples. After the first round, my fellow contestants Gary Northfield and John Aggs attempted to psyche me out, pointing out how utterly preposterous and lame it would be for us all if I won, seeing as the prize was an inflatable physical model of the Art Monkey Top Banana award - an award which I, um, designed. But look, I never win anything. I GOT A BANANA AND I AM KEEPING IT. 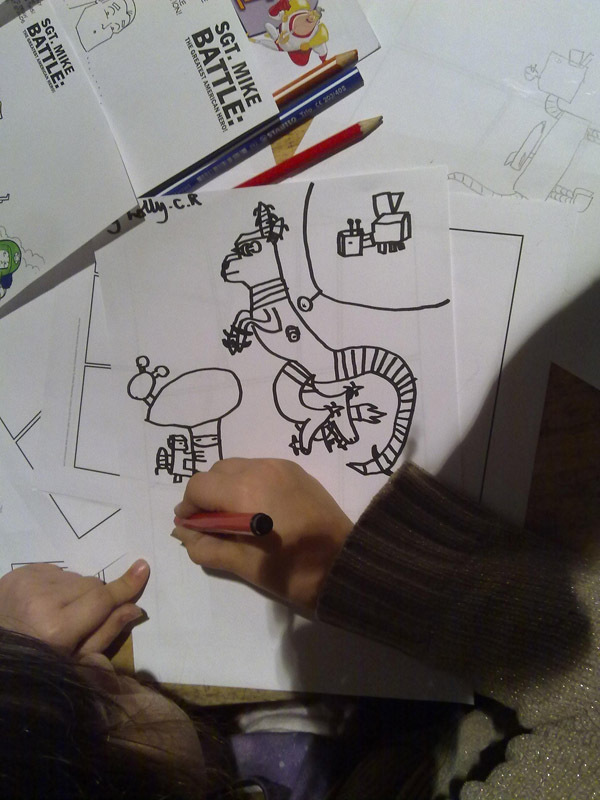 FUN THING 3: Comics Workshops! 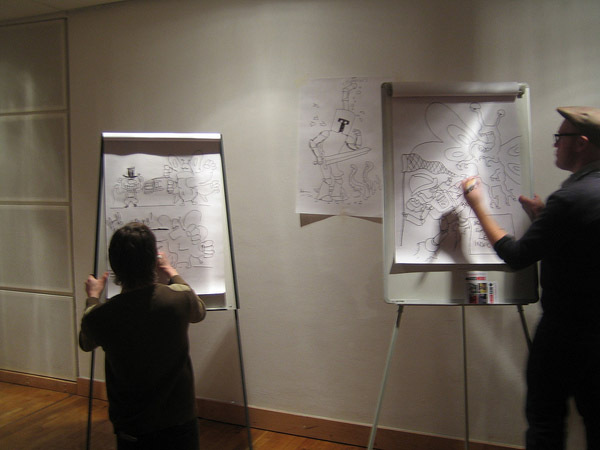 After the SHEER INTENSITY of the Draw-Off the day before, we chilled things out a bit for the Sunday and took turns running quick, informal comics workshops in the drawing area. I did a session on How To Draw (Awesome) Robots, and it was a lot of fun - and again, huge thanks to the Thought Bubble organisers for giving us the space to do this kind of thing. I dropped some Advanced Scientific Knowledge, and some Awesome Robots were drawn! I don't think I've ever seen my Principle of Robotification ("stick some missiles on it...") quite so enthusastically taken on board. Me, droppin' some knowledge. Photo courtesy of Richard Bruton, Forbidden Planet. A participant's-eye-view of the workshop! This photo is courtesy of Jennie Rigg, who wrote this great blog post about the experience of taking her daughter Holly to her first comics convention. This seems an opportune moment to thank all the Thought Bubble organisers Lisa Wood and Clark Burscough and all the brilliant volunteers who helped the event run so smoothly, and also to thank the team from The Phoenix - everybody, but particularly Liz Payton and Ross Fraser who worked incredibly hard to make the weekend a success and who made the competitions, the draw-off and the workshops so fun and easy from my point of view. And the Phoenix Feather Hunt! I completely forgot about that whole thing. When I finally escaped over to the Main Hall sometime on the Sunday afternoon, lots of the people I spoke to over there said they'd been hearing great things about the Phoenix and that things like the Feather Hunt had made a real sense of buzz about it, so kudos to those guys. Hopefully we managed to spread the word and convert some new Phoenixers. If you missed 'em, check out the shiny new Phoenix Gift Boxes - they really do look cool and would make a brilliant Christmas present. HINT, HINT. FUN THING 4: Lovely people! The great thing about Thought Bubble, and indeed comics conventions in general, is the chance to meet up and spend time with one's fellow comics people. Because, and I've mentioned this before, they really are the loveliest people. Over the weekend I got to spend lots of time with my Phoenix muckers Gary, Dave and Adam in particular, and it was an absolute pleasure. Also, on the Sunday morning I shared a taxi with Kate Beaton and Scott Campbell, and they both seemed genuinely lovely too, and I tried not to completely lose my cool and just gibber unintelligibly about how much I love Ms Beaton's work. (So, so much.) And just, in general it was a pleasure to meet up with old friends and meet new people - way too many to list here and I'd feel terrified of forgetting anyone, but special mention goes to how nice it was to see my old pals Simon Perrins and Andrew Livesay of Hope For The Future / Flying Monkey Comics again. Look, ANOTHER lovely person - the brilliant, incredibly talented Matt Baxter! Photo courtesy of Gary Northfield. OH and to the nice lady who seemed so delighted with my Kitten Reading Kierkegaard christmas card that I couldn't help but draw her a quick sketch of a Toucan Reading Foucault. I came home excited and reenergised and just brimming with love for comics, and for comics people. And to arbitrarily pick one thing to sum up so much, Foucault Toucan is basically why. The 21st century is a visual world with a visual culture, but also requires high levels of reading competency. Comics, as sequential art, are a pictorial representation of a narrative. Comic art combines printed words and pictures in a unique way. Many literacy skills are required, including the ability to understand a sequence of events, to interpret the characters’ nonverbal gestures, to discern the story’s plot and to make inferences. - International Federation of Library Associations paper at their 2009 Conference. Phoenixy Thought Bubbly ZOO of AWESOMENESS! Yes, this weekend I'll be up in Leeds at the fantastic Thought Bubble comics festival, where I'll basically be hanging out in the Phoenix Family Area drawing stuff and teaching kids to draw stuff and, y'know, stuff. 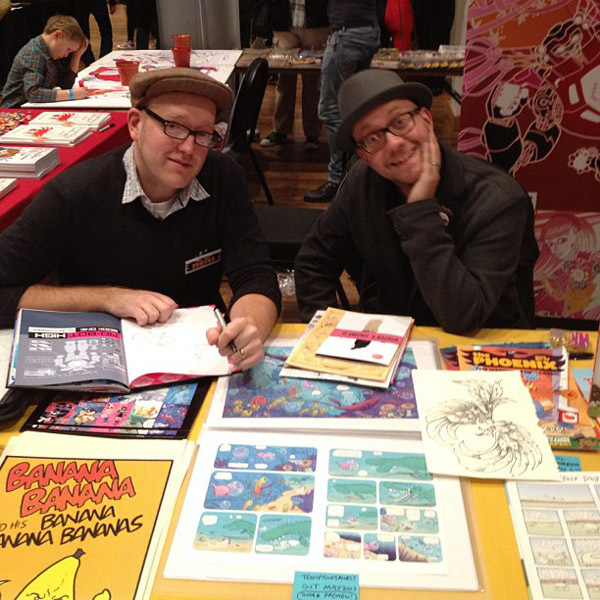 Or, to give it it's official title, being a Zookeeper of Awesomeness with my Comics Bro, the amazing Gary Northfield! We'll be running a contest all weekend for kids to design their own bizarre and outlandish comics creatures, with the best and bizarrest getting to appear IN the Phoenix in a TOP SECRET but HIGHLY EXCITING comics crossover spectacular! I have SAID TOO MUCH ALREADY! Adam will be looking to bring his particular brand of ghoulish glee with him as he vies to win Top Banana for Thought Bubble 2012. This examiner of the expired, interrogator of the interred and creator of the brilliant Corpse Talk, Adam will be ready to bring the wrath of the undead with him and to use his drawing dexterity to make his competitors stark grave- ing mad! Gary comes to Thought Bubble 2012 to ‘till it like it is’. The creator behind the fabulous Gary’s Garden, Gary will be bringing his own brand of angry insect art to the competition … but beware Gary will be treating his ‘anenomes’ like his Garden … Weed ‘em and reap! His ancient heroes may be Useleus but he certainly isn’t … Alex “The Merciless” Matthews will be looking to bring the strength of Hercules, the wrath of Zeus and the might of the Minotaur to Thought Bubble 2012. Along with Will Dawbarn, Alex is behind the stunning adventures of Useleus, the hapless hero of Ancient Greece … but don’t let this fool you, for like an ancient Greek sea monster, if you are against Alex, you better get Kraken! 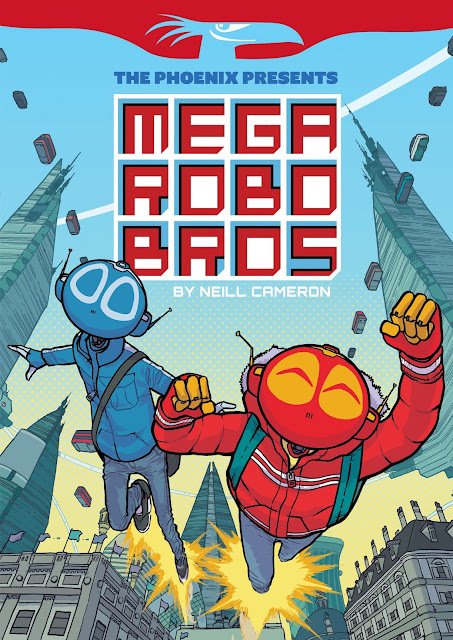 Demon of dinosaurs, paragon of pirates and brilliant buccaneer, Neill “the prehistoric powerhouse” Cameron is coming to Thought Bubble 2012 to offer his competitors more buckle than they can swash! 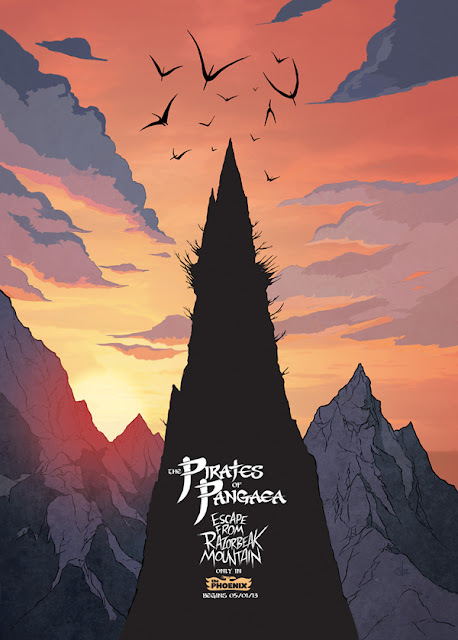 Along with Daniel Hartwell, Neill is behind the stunning Pirates of Pangaea, and not only that but he is a very close personal friend to the one and only Professor Panels from How To Make Awesome Comics! With a wealth of comic creating talent behind Neill, people often ask “Why are his comics so good” there is only one answer … they just arrgghh. 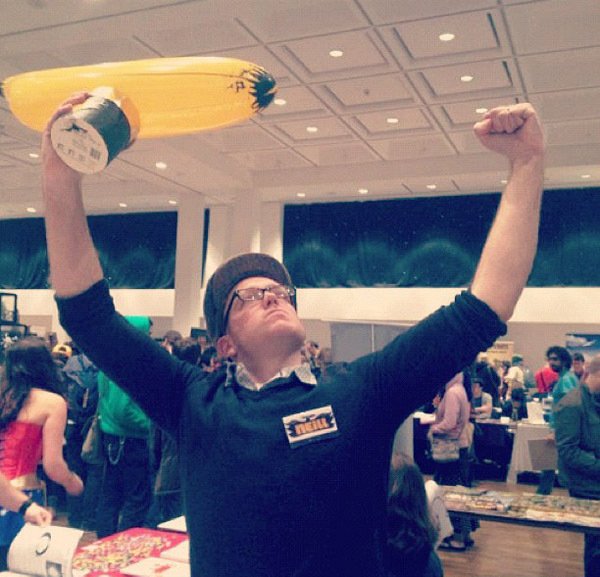 Expect great things as Rob puts his bid in to win the Top Banana award. Rob is behind the excellent alien archaeologist, Troy Trailblazer. Packed with sci-fi thrills, starbound spills and strange alien beasties Rob is no stranger to comics danger. Fellow competitors be on your guard, if the astro-assassin beats you, you’d better be ready to Apollo – gise! 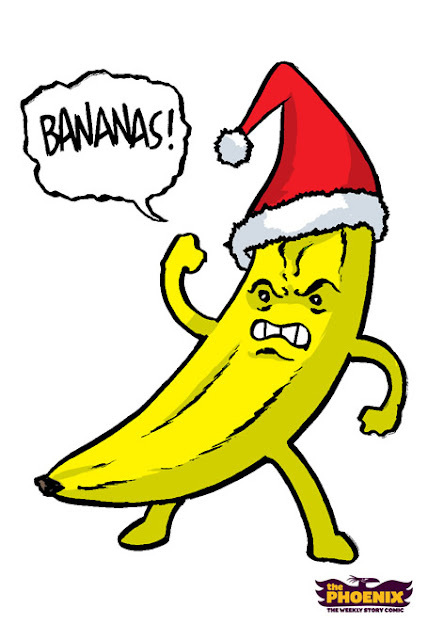 Don’t be fooled; Dave wants to be named Top Banana at Thought Bubble 2012 and he means business! As the creator of the amazing crime capers of Good Dog Bad Dog, Dave’s canine creations could have his opponents wondering if he is guilty of War mongreling! The Phoenix editorial team will have their paws and trotter crossed for Matt as he enters the comic creation ring for Thought Bubble 2012. 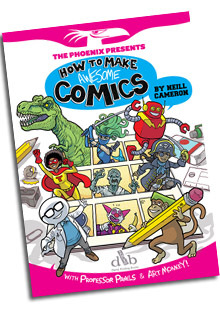 Documentor of the thrills and spills of Phoenix HQ life, Matt threatens to bring a level of comic creation that could be unrivalled. But just in case he doesn’t Chops has taught him the necessary moves to win. Prepare yourselves for high flying porky kung fu when Matt pulls out … the pork chop! 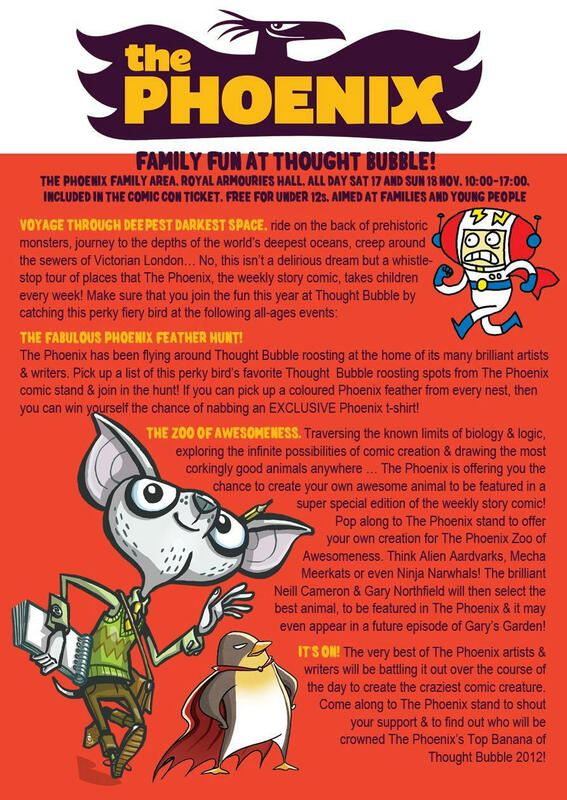 Come along to The Phoenix stand to shout your support & to find out who will be crowned The Phoenix’s Top Banana of Thought Bubble 2012! Do come along and say hello if you're around! 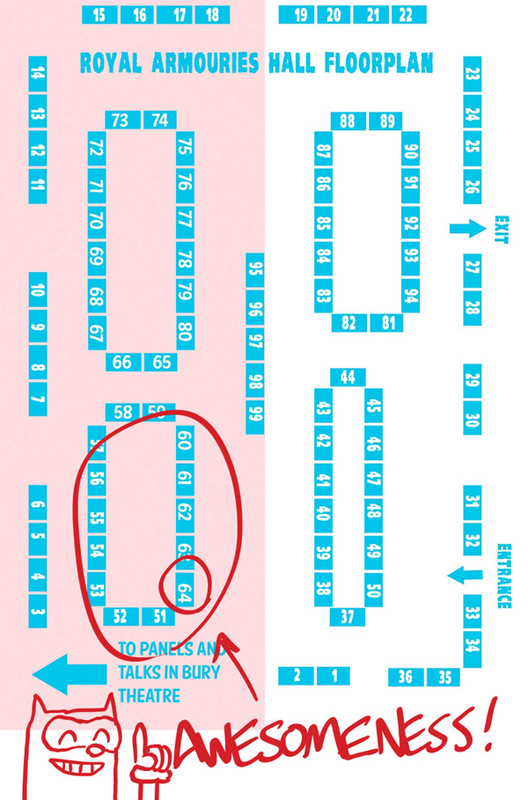 We'll be in Royal Armouries Hall, and you should be able to find us fairly easily by following the sounds of comics-battling zookeeping nonsense! Or look up the details on the Thought Bubble website, I guess. 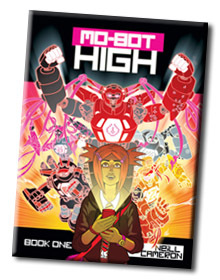 ALSO: I will have with me a limited stock of Mo-Bot Highs (which I will be sketching in), Christmas Cards, and Banana Banana Banana prints and if you fancied buying any of them, well that would HELP A BROTHER OUT.